The Cultural Palace, located in historic centre of Blaj was designed in 1930 by the architect Victor Smigelschi to host cultural events and was the only building designated for cultural use in the city. In the 1960s, the building underwent changes to accommodate the city’s cinema and later it also became home to the History and Ethnography Museum of Blaj, the city’s library and the Blaj Wire Broadcasting Centre. Following a fire in 1995, the building was seriously damaged and remained a ruin until 2012 when the municipality of Blaj took the initiative to restore the building. The fire caused major damage to the building with only the external walls and internal divisions managing to survive. All structural elements including the walls, floors, beams, stairs and roof had suffered extreme deterioration and so needed to go through a considerable structural consolidation. With a modest budget from public funds, the Palace was restored mainly to its original functional design while still retaining evidence of the building’s history. The exposed brickwork and the suspended ceiling, for example, remind the visitor of the fire which had previously destroyed the building. The jury appreciated this aspect of the project, stating: “The municipality of Blaj has successfully evoked the lost architecture of this ruined historic building with minimal interventions. 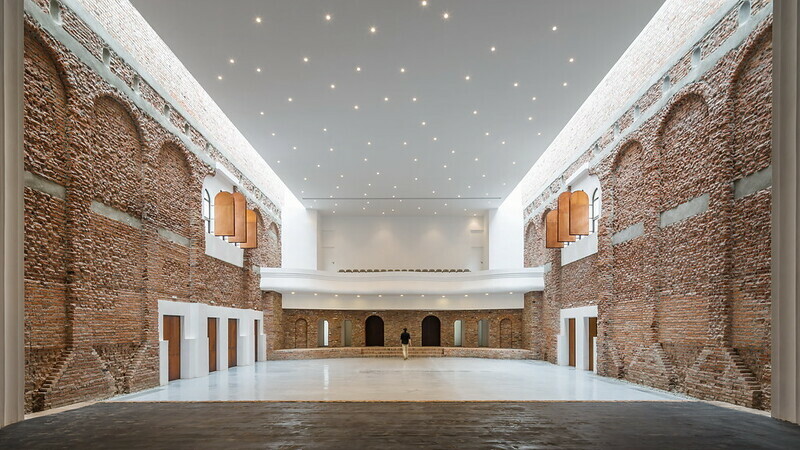 They have solely used the remains of the existing fabric without demolitions and with the addition of only the most essential facilities and structural elements”. Reclaiming the ruin has greatly improved the aspect of the surrounding urban landscape. The building, having always been used for cultural events, has returned to its role as the only centre for diverse cultural activities such as concerts, plays, film projections and exhibitions in the small city of Blaj. The importance of the building to the social and cultural life of the town can therefore not be overstated. The jury noted this and much admired “the vivid social participation the building has encouraged and the important social and economic impact it has had on the local community. It sets a national precedent and is an excellent example of what can be achieved with modern ruins”.